Wow. This is the most beautiful ring. I almost cried because I had to send it back: 1. The size eight(8) was to big for me and I was scared to take a chance on order a seven(7) and having to send it back for being to small. I wish they had a seven and a half(7 1/2) Don't be afraid to buy this ring - beyond your imagination - plus the glitter and how secure the stone with six prongs is. Buy it. 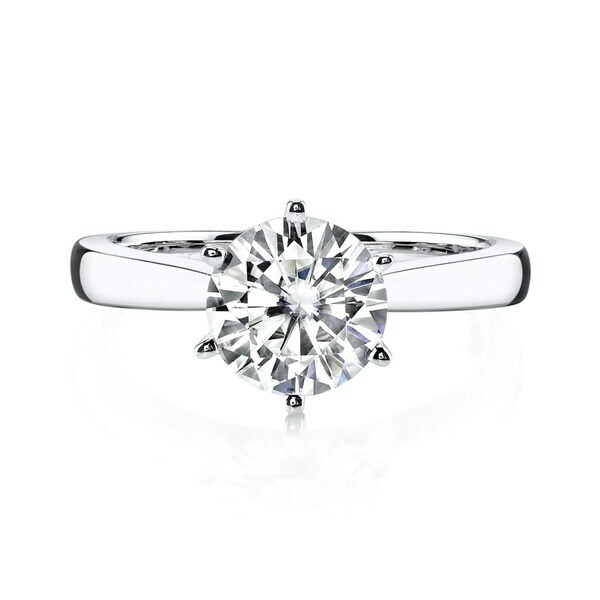 Promise her your sincere love and devotion with this Moissanite by Charles & Colvard® solitaire engagement ring. Gleaming brightly in 14K gold, this elegant ring features a sparkling 8.0mm round cut stone displayed in secure six prong setting. Sure to win her heart, this lovely ring boasts 1.90ctw. Beautiful ring. The setting is perfect. It sits high enough above the band for the stone to catch the light and really sparkle, but not so high that it's catching on everything. Very elegant and understated which is definitely my style. I paired this with two additional Charles & Colvard moissanite half eternity bands. 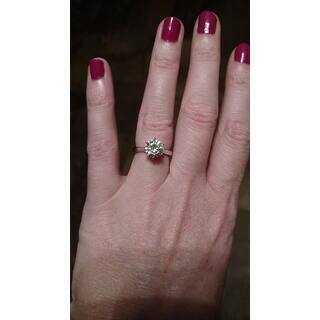 Updated review: I finally got my ring back from sizing. I asked to have it cut down to a size "6" and it is now a "5 3/4" which is ok. I'm changing my review top 1 star for the sole reason that I'm tired of NOT getting the size I ordered. This is the 3rd Charles & Colvard ring I have ordered in the past 6 months and NONE received were a size "6" like I ordered. 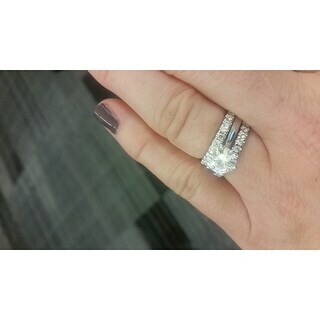 Updated review::The first one I sized at a 6 14, took a pic of the ring on the sizing wand and I sent it back to be sized and was told the ring was a size 6 on thier wand. The 1 7/8cttw I received a couple of weeks ago showed being a "6 1/2" on my wand so I took it to *** who also sized it at a 6 1/2!! None of the jewelry stores will touch this ring to make it the correct size. I am beyond as pissed as this is my engagement ring and have to wear a sizer to make it fit! 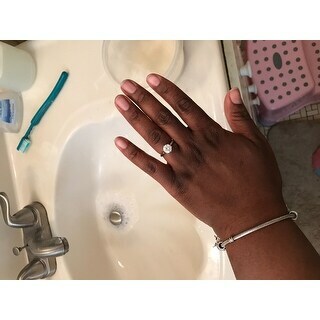 This is my 3rd Charles & Colvard Moissanite solitaire ring. I own a 1/2cttw, 7/8cttw and now this 1 7/8cttw solitaire ring. The color is the same of the 1cttw heart shaped diamond I owned years ago and Paid over *** for but this ring is so much prettier! 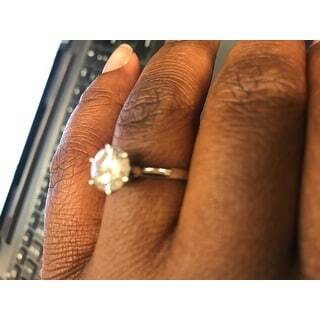 The sparkle is incredible especially in the sunlight and yes, the stone is 8mm in size. The only issue I have with the ring is, I ordered a size 6 but it measures a 6.5 on the metal ring sizer wand. I will end up having to get it sized to the size 6 I originally ordered. This ring is the perfect size, perfect weight - it's amazingly elegant. 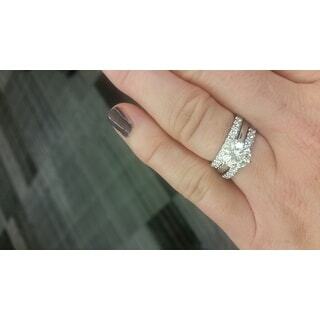 I also got the 1/2 carat Charles and Colvard 14k moissanite shared prong band to add to it. This ring is true to size. While the gold content isn't over the top, there's nothing flimsy about it. 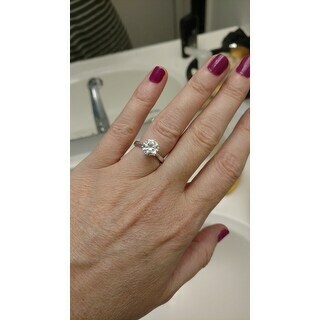 After doing much research on forever brilliant moissanite stones I told my fiance this was the way to go. This ring is beautiful and sparkles like crazy. You can find wonderful videos on you tube about this kind of stone. They even had a clip from the show 20/20 and did an undercover piece where this stone was brought into different jewlery stores and many of them thought it was a real diamond! This ring is big ! And it makes me happy to know that it isn't a blood diamond and that we didn't have to spend ridiculous amounts of money. There is a slight spot sometimes in the middle of the ring that may look dark but it is barely noticeable but do not let that stop you from getting this ring and seeing it for yourself! And it arrived way earlier then they said it would ! Oh my...I think I'm in love!!! I'm speechless! This ring is amazingly beautiful. It is the perfect size and looks undeniably real. I'm very happy with this purchase and this is my second Charles and Colvard purchase. These people really know what they are doing and make quality jewelry. I will never go back to diamonds! 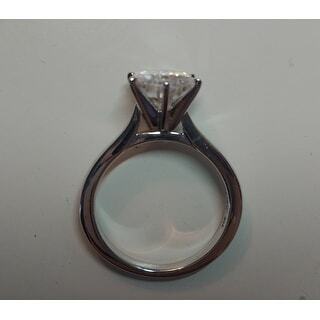 Cannot afford a genuine diamond of the same clarity/ color/ carat.... Charles and Colvard FBM are a beautiful alternative. 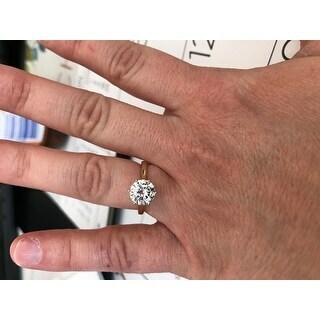 I have brought my ring into jewelers to be cleaned and they have only complimented my beautiful "diamond", as the setting is 14K Gold, there is no reason to believe it would be otherwise. The color is not so BRIGHT WHITE as to look like a CZ. I can confidently wear this in any situation without fear of losing a piece of jewelry worth upwards of $10-20K. It's gorgeous! 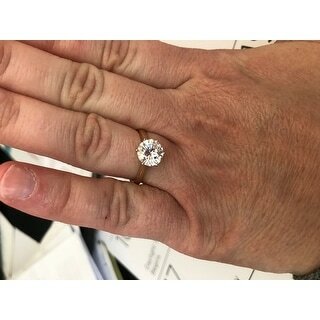 After losing my 1 carat round solitaire we decided not to spend more money on another diamond. 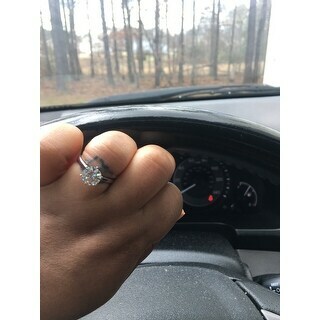 After doing research and searching for a replacement for the one I lost, we found moissanite. This ring in particular looks like the diamond I lost but a tad larger and it also shines beautifully (maybe better than my diamond). I absolutely love it and I have been wearing it a week without any complaints. I'm a stay at home mom so I use my hands alot. Its definitely a keeper and if you are wondering if you should order it...stop hesitating and buy it! 1st pic outside lighting without band, 2nd pic outside lighting with single band and 3rd pic indoor lighting with double bands. Hope this review helps someone get a feel for what it will look like by itself or with a band or two. Pretty ring... the order arrived sooner than indicated and in a Charles and Colvard ring box; however, there was not a certificate of authenticity. All Charles and Colvard moissanite jewelry comes with one. Overstock is working on this issue. Additionally, the color is not as nice as the other moissanites pieces I’ve purchased directly through Charles &amp; Colvard. 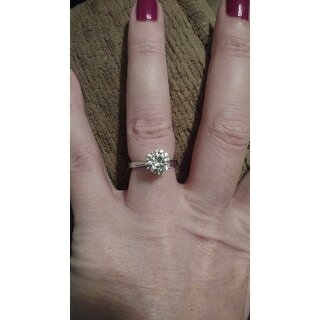 My first husband gave me an amazing diamond in a platinum setting, he paid almost $$$$ for it 15 years ago. When we got divorced I sold it and got $$$$ This is far more beautiful. And I don't feel like a sucker. Beyond beautiful! Arived even before scheduled! will never buy diamond again! I'm really upset with Overstock, they advertise this ring as near colorless but it is clearly tinted yellow! Then because it is a supposed "big ticket" item they make you pay for the return shipping, seriously Overstock!? The description on this ring should be changed to Near Colorless is you are color blind! I think it's really ridiculous that you'll make the customer pay to return an item that is not described correctly! When a stone is labeled as near colorless, one wouldn't expect to open the box and see a yellow tinted stone! I'm not sure I'll ever use Overstock again! Beautiful ring with no yellow cast to color tone. Very bright, clear sparkle. I am very pleased with it! Excellent color. I've had it over a year and it's still perfect. The ring arrived quickly. I had to return it because the stone was not as clear and as bright as I would like. The ring was made very well and the band had a nice width to it. The stone was just not what I was looking for. I am so happy with this ring. It is just gorgeous. Very comfortable to wear. 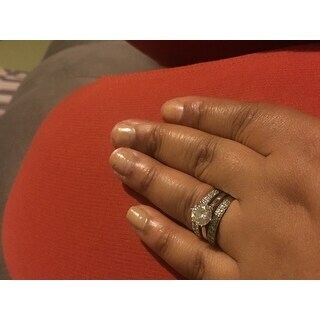 I get so many compliments on my ring and everyone says that my fiance must really love me to get me a ring like this. The color and clarity is unsurpassed! 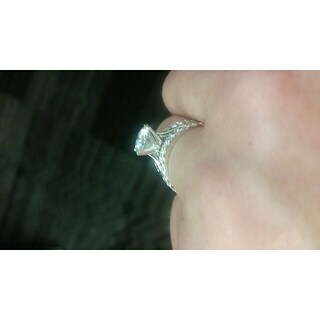 Thank you Overstock for helping me get an awesome ring at a reasonable price. It's a very comfortable ring. The setting is high, which I like as it shows off the stone very well. The size of the stone is pretty large, but fits well with a larger hand. Overall I really like it. Lovely. I originally ordered one directly from the makers website. Three times the price. Then I found this one. Excellent sparkle. Very nice setting . So far I am very pleased and it looks excellent with my diamond wedding ring. Arrived quickly in beautiful packaging. 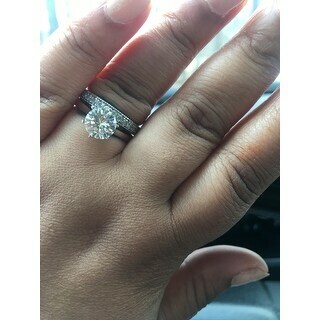 Beautiful stone, doesn't look different with forever one GHI but setting is poor and I order size 5 but came way big..size. I'll return it but wanna exchange if right size ring is guaranteed. "Is this considered to be a colorless or is this a near colorless?" "Does this ring come with a box?" Yes, it does. It comes with a standard size box with cushion similar to what a typical engagement ring store would provide. "what size does this ring come in? I don't see any option to select a ring size. Thanks"
The sizes available are listed in the options tab. "Is there a matching wedding band for this ring. Thank you!" There is not a wedding band designed specifically for this ring. "The ring states that it is 1 7/8 is that almost 2 tdw?" Yes, the stone is an 8.0mm Forever Brilliant round moissanite gemstone. This has a Diamond Equivalent Weight of 1.90ct. 7/8 is closer to 1 than not, right? "What is the return policy if for some reason I don't care for the ring?" "My wife's ring size is 4 1/2.Can I order in that size?" This size is not available, but gold can be resized by a professional jeweler. Actually Overstock is wrong. None of the jewelers in my area will touch the ring for sizing. I ordered a size 6 but the ring is measuring a 6.5 with my metal sizing wand and Kay Jewelers and Zales got the same size but refuse to size my ring to the correct size because it is a Moissanite stone.. When you fall in love with a ring that doesn't fit, your first instinct may be to cut your losses. Fortunately, ring resizing lets you change the band circumference, so you can buy that one-of-a-kind engagement ring, take full advantage of an inherited collection, or wear your favorite rings on a different finger. Want to know how to wear a Claddagh ring to show your relationship status? Check out this guide to learn how. Why Some Rings Discolor your Finger from Overstock.com. Our guides provide customers with information about why some rings discolor your finger.